Windows has several areas that are not as customizable as I would like them to be. The start menu comes to mind with its static links that cannot be changed, or Windows Explorer. I and several other users I spoke with would like more customization options, while the general Windows user base seems to be indifferent to that request. Computer Customizer is an interesting application that can be used to add quick links to the My Computer listing in Windows Explorer. 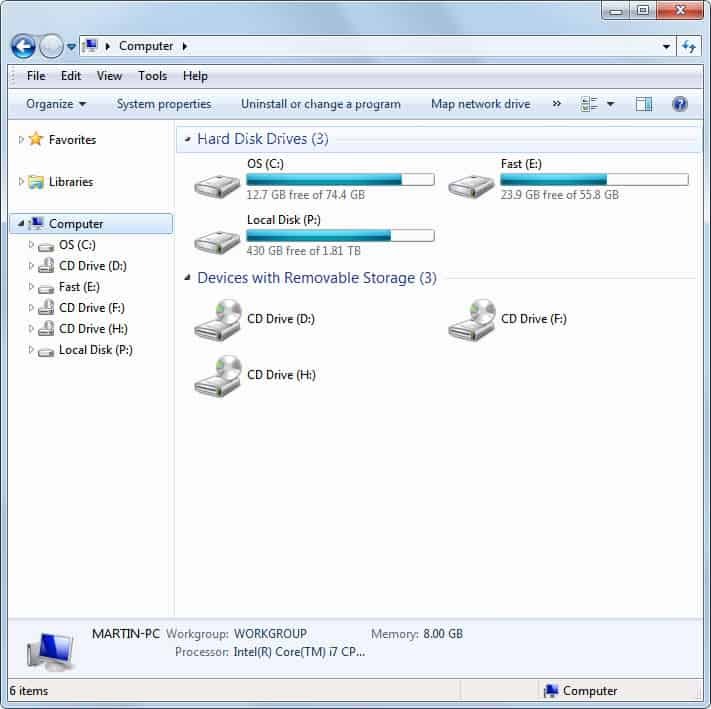 My Computer, or Computer for Windows 7 users, displays all connected hard drives and removable storage devices in Windows Explorer. The listing contains lost of white space, as most Windows users have no more than a couple of local hard drives and removable storage devices connected to their computer. The portable application Computer Customizer adds selected items to the My Computer display. Available items are divided into common items and other items in the program interface. Common Items: Internet Explorer, Action Center, Display, Fonts, System, Autoplay, Default Location, Administrators Tools, Desktop Gadgets, Windows Update, Language Selector, Folder Options, Control Panel, Notification Area Icons, Printers, Taskbar and Start Menu, Recycle Bin, Network and Sharing center. 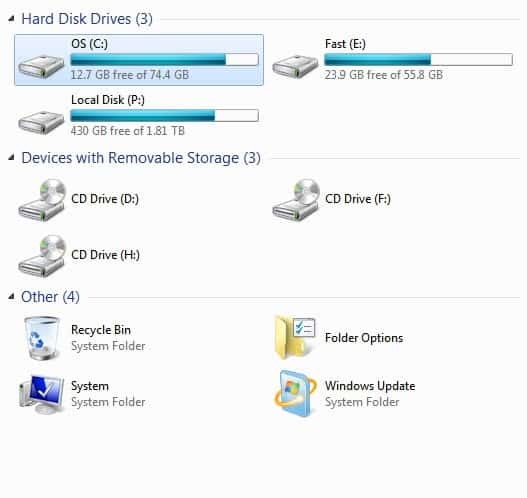 Other Items: Computer Management, Network Connections, User Accounts, Windows Mobility center, Speech Recognition, Sound, Windows Firewall, Parental Controls, Power Options, Backup and Restore, Color Management, Troubleshooting, Internet Options, Programs and features, Device Manager, Keyboard, Mouse, Homegroup. 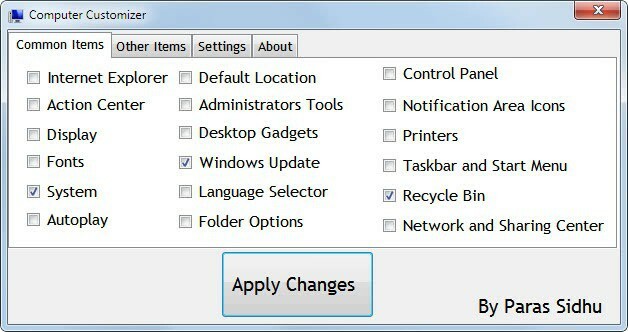 Items are enabled with a click on their checkbox and the selection of Apply Changes. They are immediately visible under My Computer, the page may need to be refreshed though if it was the active page before making the change. This is best done by switching to a drive and switching back to the My Computer listing. All items that can be added are accessible elsewhere in the operating system. Many are Control Panel applets or administrative tools. The main benefit of enabling those items in Windows Explorer is to have another option to open those programs or configuration options in Windows. Who benefits from adding items to My Computer? All users who use the Windows file manager regularly. Adding often used programs and features to Windows Explorer can optimize the workflow of some operations further. Access to printers, computer management, the device manager and network connections seem to be prime candidates for that. Computer Customizer has been created by the 13-year old Indian Paras Sidhu. It can be downloaded from the developer's Blogspot website. The software tested fine on a Windows 7 Professional 64-bit installation. No compatibility and dependency information are provided on the developer website. I’d like to add that I keep my folders set in list view format, and this program works in list view also. I personally just put everything at quicklaunch, but this works too.